Massachusetts has a well-earned reputation for harsh winters. Heavy snow, ice storms, humid summers, and salty ocean air can take a toll on your roof. Blizzards are common along with frigid cold temperatures and may last for a few months. Consequently, we will often have high heating bills. And, with several warm days in the summer months, cooling costs may also become a problem. Put a little money back in your pocket by installing one of our energy efficient metal roof systems. Along with being cost-effective, these roofs are also lightweight but can handle the weight of heavy snows as well as wind gusts of up to 120 mph. 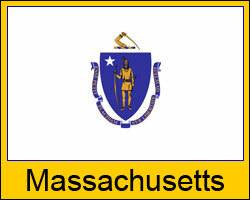 We service the entire state of Massachusetts and will have your entire order shipped directly to the work site for added convenience. Looking for metal roofing in Massachusetts? All of our listed prices are valid for any area within Massachusetts and some shipping restrictions do apply. Click here for details on shipping to your job site. Options to fit most budgets. A wide selection of colors, styles and finishes. Our metal roof systems offer a long life-span along with a warranty of 30 to 50 years on most products. We serve Boston, Worcester, Springfield, Lowell, Cambridge and every Massachusetts town and community in between!